This is a spray you mist in your kitchen, to somehow make yourself want to eat less food. It sells for $39.99 a bottle. 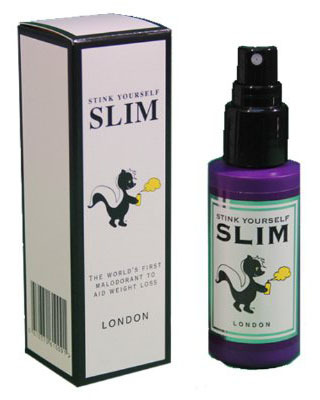 In the Stink Yourself Slim dreamworld, the brain is a magical organ that senses your desire to lose weight and un-hungries your flabby body when you spray a magic purple bottle. Unfortunately, the theory that a rank-smelling kitchen would stop anyone from snacking can easily be disproven by anyone who’s lived in a college dorm.